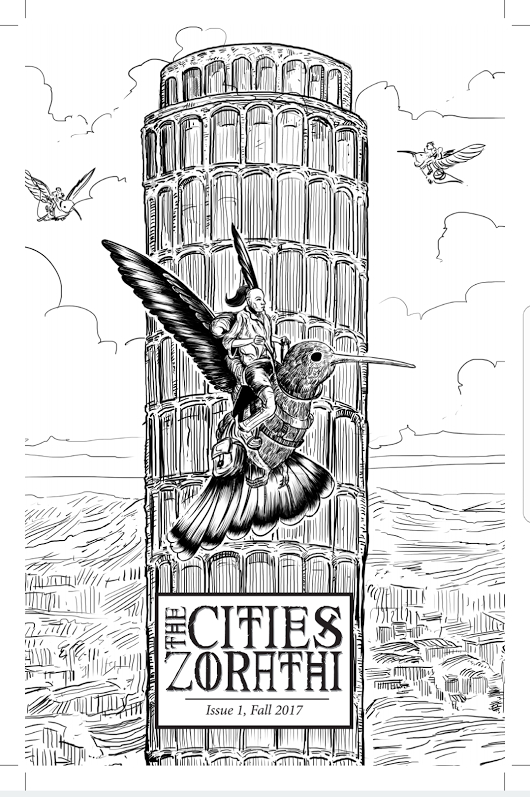 The Cities Zorathi Issue 1, Fall 2017, was written by Duncan McPhedran, with art by Alex Mayo, Claytonian, and Duncan McPhedran. It was published by Zorathan City State Press. This zine focuses on a campaign setting for Dungeon Crawl Classics - the three Cities of Zorathi. There are three of these cities. In order of their age, they are Crone Zorathus, Dame Zorathus, and Lassie Zorathus. This issue gives an overview, and offers a focus on Crone Zorathus. Introduction: Exactly what it says on the tin. The Cities Zorathi: A brief overview of the cities, including some notes on history, organization, and culture. 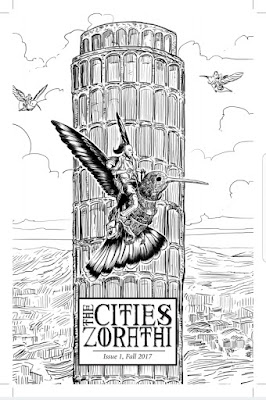 Factions of the Cities Zorathi: Organizations and their interests are part of the urban landscape, and vital to making a city-based campaign come alive for its participants. Seven factions are briefly described, with more information given about the Council of Trade and Industry and The Inclusion League. Even if you don't intend on using the campaign materials herein, this article should spark ideas for your own game. Zorathan Coinage: The common currency of the Cities Zorathi. Common Wares in Zorathan Markets: This article gives prices using the Zorathi coinage. Most of the items reproduce those found in the DCC core rules, but there are a few items PCs may want that are not otherwise covered. Be aware that, if not using the Zorathan campaign setting, you will need to convert these prices back to standard coinage. Crone Zorathus, the Old City: Enough information to have a useful overview of the oldest of the Cities Zorathi. This includes information on power groups, geography, architecture, holidays, and so on. This is a good example of how information of this type may be succinctly provided. Locations: The Mental Haberdashery: Not your typical hat shop. There are 36 possibilities for the effects a hat might have, most of them are negative, and the hats are not cheap. The Zorathites: The author provides a d30 chart containing name, occupation, condition/quirk, plot hook, and "stuff" that they might have on them. This is the sort of chart that is useful in almost any game, and is certainly useful in an urban sandbox setting. The Ram of Light: This is the full patron write-up for the Ram of Light, once a mighty god named Ramat who has since fallen on hard times. There is only one patron spell, and spellburn is brutal. One wonders if this Ramat has any relationship to the old god that The Ruins of Ramat are named for.